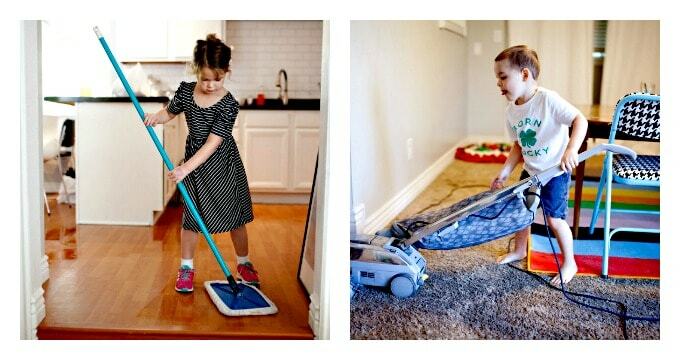 These games to get kids cleaning make housework almost fun! Cleaning is an important life skill, but it’s not always a fun one to learn. As a parent, you know the importance of putting away toys and keeping a clean house, but kids don’t always want to pitch in and do their part. That’s where knowing some games to get kids cleaning can help. Pick a room and choose a game, then watch your kids eagerly help. They’ll have fun while learning how to clean and you’ll get help around the house without all the whining. Although most of these games don’t require any specialized equipment, your kids will find it easier to clean if they have child-sized tools. Here are some Amazon links to highly-rated child cleaning products. For more about the adult-sized cleaning tools and supplies that I use in my home, check out my Recommended Products Page. 6-piece Child’s Cleaning Playset with broom, mop, dustpan, brush and storage stand. Child-sized vacuum with real suction and removable debris holder. Child-sized cleaning caddy with a spray bottle, squirt bottle, cloth, brush, and more. This game teaches kids to clean in a logical order. To play, you need to plan a reward for completing the cleaning “mission” — a treat like ice cream, 30 minutes of screen time, or even a small toy from the dollar store all work. Take a set of brightly colored index cards and write down simple cleaning tasks for your child’s mission. Have them turn in Mission Cards as they complete each task to get the next one. When they’ve finished the entire mission they get the reward! This game teaches kids to be thorough while cleaning. Kids love Easter egg hunts, and this game puts that enthusiasm to work year-round. You’ll need stickers or other small items to hide — even coins work for older kids since we all know how they love money. To play, you go around the room first and hide the treasure on surfaces which need dusting. If your kids are older, you can hide treasure under things, too — after all, knickknacks need to be picked up and dusted beneath now and then. Then, turn your kids loose and let them get cleaning. Be sure you keep track of how many items you’ve hidden, though — you want to make sure they’ve done a good job! This game teaches kids to make tidying their rooms part of their daily routine. If you’ve ever read Goodnight, Moon to your kids, you already know the basics of how to play this one. Before your child gets in bed, tell them it’s time to say “Goodnight” to different toys then put them away, so their toys get some sleep, too. For younger children, you’ll want to be specific: “Say goodnight to your blue stuffed bunny,” for instance. Older children can handle more generic descriptions, such as “Say goodnight to your cars.” Once they’ve picked up their room, reward them by reading their favorite book to keep them interested in playing this game night after night. This game helps children learn colors, shapes, and numbers. The trick is, whether they get it right or not, they’ve got to put it away and then tell you what they found. So if you tell your 4-year-old “I spy something red” and they put away a toy car, but you meant the red ball, they need to keep putting away red things until they get it right. Obviously, you want to let them get it right on the first guess now and then, so the game continues to be fun! 5. Smile, You’re On Camera! This game helps children learn to clean thoroughly. Kids are hams who love pretend play, and this game allows them to put those traits to good use. To play, grab your phone camera and tell your child you’re going to make a pretend commercial in which they’re the star. Now, give them some soap and water — or one of my non-toxic homemade cleaning mixes — and have them show people how it’s done. As the commercial’s director, you can coach them if needed — “Let’s see how that works on the countertop, shall we?” — and call it a “wrap” whenever you want. This game teaches kids to stay on task. When you need to get your housework done while your children do chores, this is the perfect solution. To play, write down 4 or 5 things you need to do, and an equal number of things for your child — it doesn’t even have to be in the same room — then “compete” to see who finishes each task first. For example, your list might focus on washing the dishes, wiping the kitchen counters, sweeping the floor, and taking out the trash. Your child’s tasks might be picking up her toys from her bedroom floor, putting her clothes in the hamper, returning shoes to the closet, and making her bed. Give points for finishing each task first, and the one with the most points is the winner. Chore time becomes fun time with cleaning games! 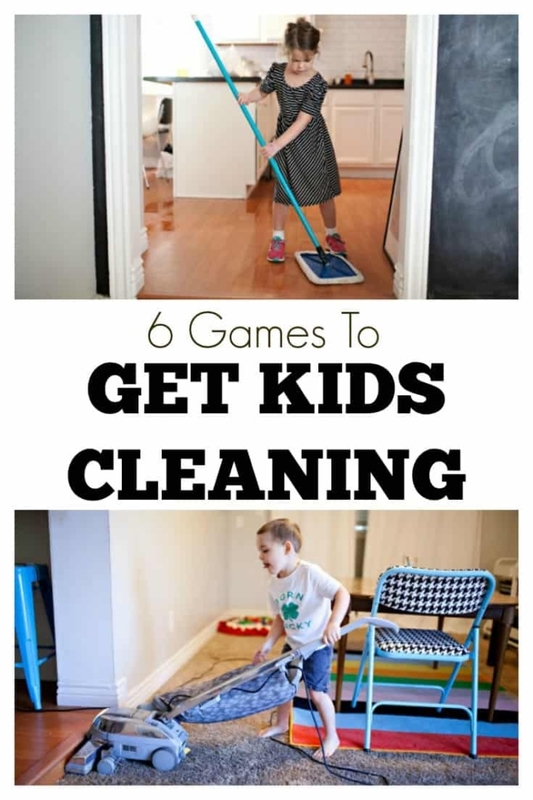 Need some ideas for tasks to use when playing these games to get kids cleaning? Check out these chores that kids can do for an age-appropriate printable list.